Our OEM replacement seat covers are guaranteed to match your vehicles interior! 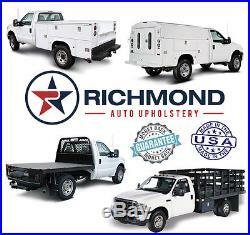 Richmond Auto Upholstery has been manufacturing automotive seat covers for over 35 years and specializing in Heavy Duty/Super Duty original factory replacement seat covers, armrest covers, steering wheel covers & much more! Leaving you with a OEM quality cover that is made in the USA without paying high dealership prices! We manufacture all of our replacement covers to the OEM specs and only use genuine original factory materials. All of our materials come in the original factory color. There is NO Painting or Dyeing involved so your cover will never peel or fade! We have been supplying franchise dealerships with our Handmade Replacement Covers for over 35 years and we are now offering them to the public! If you have ANY questions! 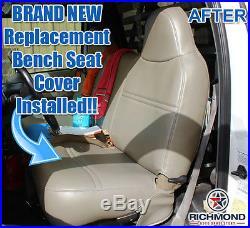 Thank you for choosing Richmond Auto Upholstery for your Automotive needs! Original Factory Color: Medium Parchment "Tan". Fits: Front Bench Seat Bottom. PROUDLY made in USA (Houston, Tx). OEM Quality material or Better, Not an Economy Aftermarket Grade. 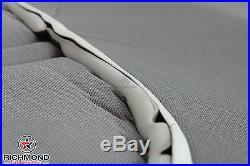 Actual Replacement Cover - NOT A SLIP ON or PULLOVER. You will REMOVE the OLD COVER & then install the New Cover! Not Sure What Color or Cover Your Vehicle Needs? Just give us a call! We also carry this seat in the factory Gray color. Seat Cover is Guaranteed to fit the following Vehicles. 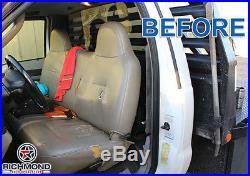 You will not need to remove your bench seat from your truck when installing our seat cover. 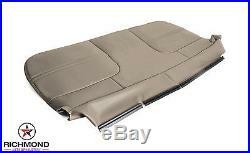 This is an actual replacement cover, you will need to remove your old seat cover then install our seat cover on your existing cushion. Our seat cover does not come with pre-cut seat belt holes, we will provide you with instructions on how to make a small incision for your seat belt and how to reuse your seat belt retainer from your old cover. Installation is very easy and takes about 20-35 minutes. If you need help or have any questions please feel free to give us a call! We have been specializing in Super Duty Truck Seats for over 35 years and have been providing official Ford Dealerships with our original replacement seat covers for over 14 years. We carry all of these covers in EVERY factory Ford color! 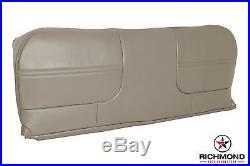 Front Bench Seat Lean Back (Top) Replacement Vinyl Seat Cover. 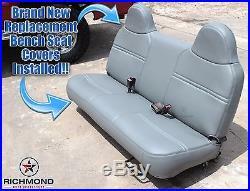 Front Bench Seat Bottom & Lean Back Replacement Vinyl Seat Covers. Leather Steering Wheel Cover w/Needle & Lacing Cord. Our seat covers are manufactured with OEM quality materials. 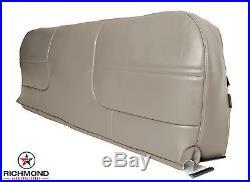 These covers are designed to exceed OEM specs but with an OEM look. How to clean and maintain your new Replacement Seat Cover. We recommend using Lexol Leather Cleaner. Apply the cleaner on a applicator pad, then rub it on the cover. Repeat once a month for longevity. Avoid all purpose cleaners and protectants because they will stain and damage the seat. 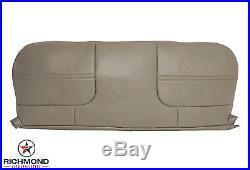 Seat Cover with UPS Ground. 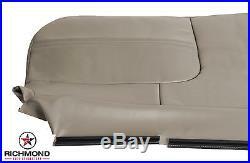 The item "2000-2002 Ford F250 F350 F450 XL -Bottom Bench Seat Replacement Vinyl Cover Tan" is in sale since Tuesday, June 13, 2017.